Looking for a way to keep your Easter celebration light, but still satisfying? These three skinny desserts are crowd-pleasers for anyone watching what they eat (recipes courtesy of Jelly Belly Candy Company). Chocolate-Filled Strawberries with Jelly Belly jelly beans have 62 calories each. Chop chocolate and place in heatproof bowl, set aside. Bring cream to boil in saucepan over medium-high heat. Pour cream over chocolate in separate bowl, stir to melt. Add butter and whisk till smooth. Let cool to thicken up, then whisk till fluffy. Fill pastry bag or resealable freezer bag with the corner snipped off to fill strawberries. While ganache cools, use melon baller to scoop tops off the strawberry to create a little cup. Trim bottom tip strawberry with knife to make it stand up. Apply thin layer of edible sugar glue to bottom half of strawberry, then spoon on sprinkles. 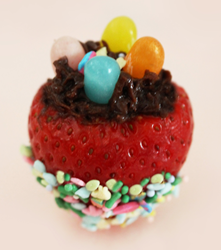 Fill the strawberry with approximately two teaspoons of chocolate ganache. Finish with four Jelly Belly jelly beans pressed into ganache. *Edible sugar glue can be found in most cake decorating or crafts stores. Makes 12-18 strawberries, 62 calories each. Heat oven to 375⁰F. Sift together flour, baking powder and salt and set aside. In large bowl beat shortening, sugar, egg white and vanilla extract until well blended. Add flour mixture and milk until blended. Stir in coconut. Roll dough into a ball, divide in half. Roll 15 one-inch balls from each half and place on ungreased baking sheet. Make thumb print depression in center of each ball to form nest. Bake 6 minutes. 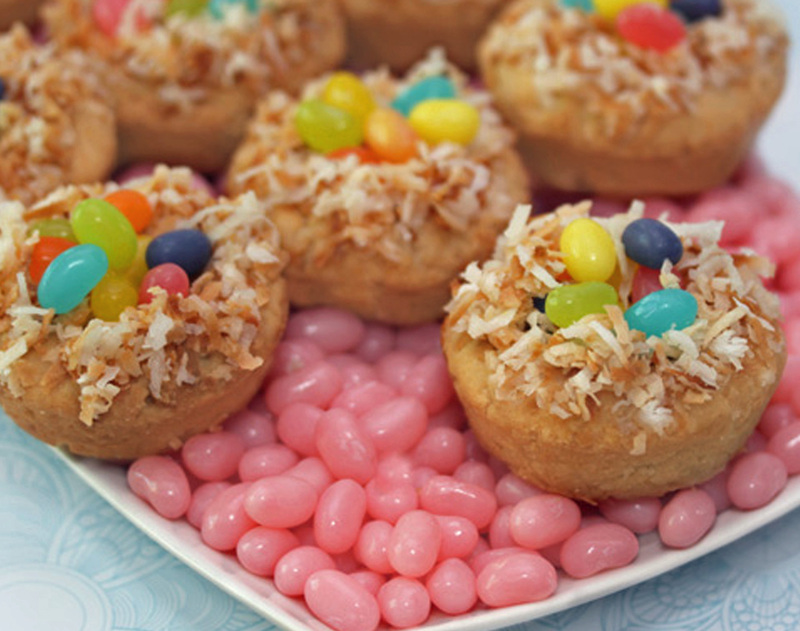 Remove from oven and place 4 Jelly Belly beans in center of each cookie. Return to oven and bake 5 more minutes. Transfer cookies to wire rack to cool. Preheat oven to 170 degrees F. Line baking sheet with parchment paper. Set aside. In clean dry mixing bowl beat egg whites, salt and cream of tartar with electric mixer until soft peaks form. With mixer running add almond extract and gradually add sugar. Beat until stiff and glossy. Spoon meringue into pastry bag with large flower tip. Pipe meringue onto parchment lined baking sheet in nest shape. Leave center large enough to hold scoop of ice cream. Select a variety of colors of jelly beans, or a single color theme, such as blue or red jelly beans. 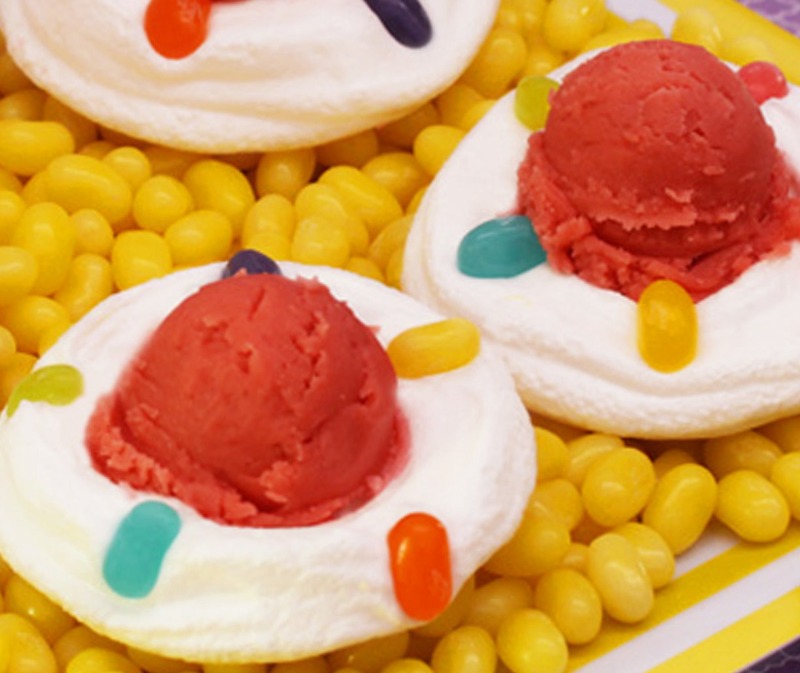 Gently press jelly beans into sides of meringue. Bake 2 ½ hours or until hard. Store in air tight container. Serve with scoop of orange sherbet in center. Can be made two days ahead. Makes 6 nests. 206 calories per nest. Discover more spring and Easter ideas on http://www.jellybelly.com/spring-and-easter-ideas.